The drama from the recently completed NASC in Buffalo continued into the second part of the "double header" from North America. Many of the players involved the week before made the relatively brief trip to Niagara Falls for a further 21 games of Scrabble. Of all the many notable events from a dramatic four days, here are five highlights we hope you enjoy. 1. The truly global Scrabble event. 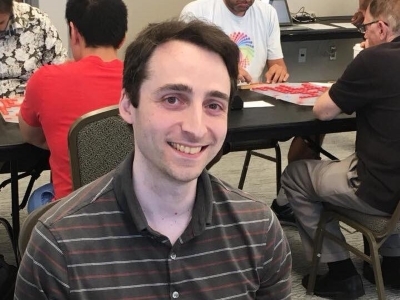 The Niagara Falls tournaments have been generating immense interest amongst the international Scrabble player for some time now and is fast becoming one of the "must-do" tournaments for the enthusiast. The end result is that you can be guaranteed a truly global attendance - amongst the 101 Collins and 73 TWL players, there were representatives from twelve different nations. 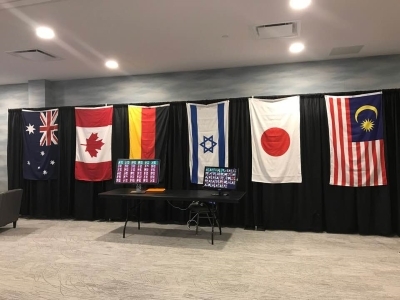 Players from the following countries were represented: Australia, Canada, Germany, Israel, Japan, Malaysia, Nigeria, Singapore, Sri Lanka, UAE, UK and the US. 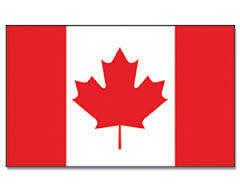 Each country's representatives are met with their national flag, an example of which is provided in the photograph you see. The multinational flavour to the tournament was especially highlighted in the video presentations that were shared on social media during the event. Following from the excellent social media coverage at the NASC the week previous, the many thousands around the world keen to keep up to date with news from Niagara Falls were not disappointed and were treated to some excellent footage. NASPA's Social Media co-chair Josh Greenway and Social Media Rep Shelley Stevens were busy conducting video interviews with the event's many international players, including Karen Richards, Israel's Evan Cohen and Omri Rosenkrantz, as well as Michael Tang (pictured). The footage was distributed widely and well received. As Josh Greenway explains, "NASPA continues to invest in social media outreach to attract new membership. As the wider population evolves their social media consumption from text and images to video and live video, NASPA is focused on evolving its social content production." We wrote last week about the innovations in video that supported tournament coverage, and in the absence of live streaming of games, this footage again demonstrated how effective it can be in maintaining and generating interest in an event many would love to attend but were unable to this time around. As one would expect with a tournament that features this many quality Scrabble players (three World Champions, and last year's NASC Champions in TWL and CSW to name a few), the quality of the words played would be near guaranteed. Some of the words featured included TOCKLEY, GLADIATOR (through AT), EXOCARP, ANTIMONIES (around MON), WILDLIF(E), BEATBOXER, SAU(F)GARD amongst the many beautiful plays. There was even talk of a game on the first day featuring the addition of MIND to make a word that means to deliberately inflict psychological damage! Keen followers of Scrabble players on Twitter and Instagram would have caught up with many of these (and more). 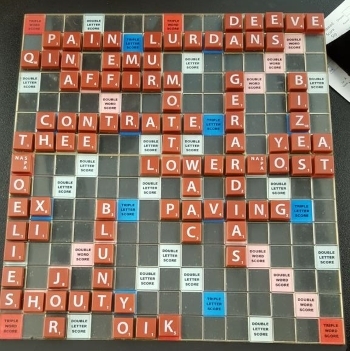 One such player who is a must follow for Scrabble is Austin Shin - an avid tweeter of games, his L(OW)ERMOST featured here is but one example of the board photos he posts after each game. At Niagara Falls, as with many events, the ability to score highly is frequently seen. Occasionally, it is a solo accolade - there were five scores over 600 over the four days, with the highest being Will Anderson's 663 in Game 1. Nathan Benedict topped 600 twice and Nigel the once. The final 600+ score to mention belongs to Joshua Castellano, and his 623 in Round 4 against Roland Filio. 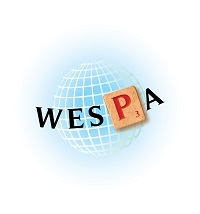 This game is notable as the latest entry into the WESPA Top 25 aggregate games of all time. Roland's score of 496, saw the game combined score of 1119 enter in at Number 21, knocking out a 7 year old game of Nigel Richards v Chollapat Ittiarhee from the list. 5. Congratulations Will Anderson, winner at Niagara Falls! For much of the last four days, the name on the winner's trophy looked like a foregone conclusion - last week's NASC TWL runner-up, and the current WESPA #2, Nigel Richards looked like taking all before him after losing the last three in Buffalo. A Round 3 loss to Amit Chakrabati paved the way for a 14 game winning streak, including wins against two former World Scrabble Champions and the defending Champion at the event. Nigel's second loss did not come until the last day... in the first of what would be four straight games against Will Anderson. Will Anderson's tournament started fairly similarly, this time with a Round 2 loss to George Macaulay which paved the way for a mini winning streak of 4, broken in Game 8 by multi-times Australian Champion John Holgate. A Round 12 loss to Becky Dyer the only blemish until Nigel took out Game 19, 504-354. Their game before was a comprehensive 556-359 win to Anderson. That win was to be Nigel's final for Niagara, as he went on to lose the last two to Will - including the last, which you can play through here. This was the second time in a week where Nigel Richards lost the final games to bow out of victory and the third time in 12 months where this has happened. For Will Anderson, last year's NASC Champion in TWL had taken out one of the biggest Collins tournaments for 2018.